The deciding game of the World Series is presented in its entirety, preserving the complete unedited footage of the game for which Cubs fans had been waiting 108 years! Includes four audio options: English-language broadcast, Chicago Cubs radio, Cleveland Indians radio, and Spanish-language broadcast. 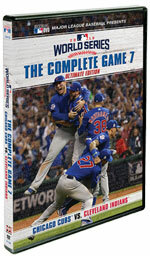 Bonus disc includes other highlights from the Cubs postseason along with parade footage. Approx. 5 hours. DVD.